One of my favorite things to watch at a big league game is the players playing long toss. Does that make me strange? 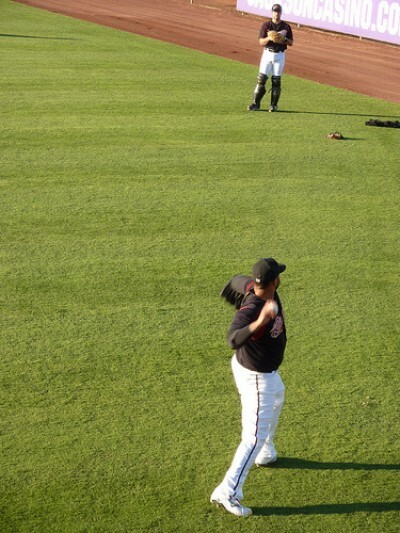 Whether it is the starting pitcher beginning his warm-ups in the outfield or the position players in front of the dug out. I enjoy watching this part of their pregame ritual. Besides being a pregame warm-up fan, I believe long toss is the best way to develop arm strength especially in young ball players. When I play catch with Lefty, I incorporate long toss at least a couple of times a week. We begin at a close distance and play normal catch. Once we are warmed up, I continue to take a few steps back to increase the distance between us. We use a relaxed motion and crow-hop to get the ball back and forth. We focus on stretching out our arms instead of firing missiles back to each other. A little air underneath the ball is fine. Once we get to a distance to where Lefty’s is throwing comfortably and the ball may bounce once or twice before getting to me, I know we are at a good distance. We do about a dozen throws at that distance and then slowly close the distance back to each other. I am not sure if Lefty knows how much I enjoy doing this drill with him. It is kind of calming and therapeutic for me. Now that must definitely make me strange, right? Long toss anyone?